Wood species: Bubinga, Bloodwood, and Maple. Origins: Brazil, Africa, and USA. Number of Pieces: 385. 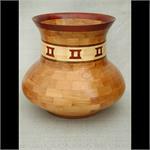 Hours to Construct: 37. size: 8.75" x 8" x .25" Segmented lidded vessel. Wood species: Bubinga, Maple, Wenge, Walnut, Elm, and Bloodwood. Origins: Africa and USA. Number of Pieces: 601. 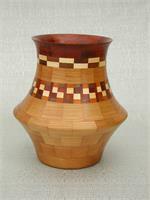 Hours to Construct: 39. size: 10.00" x 8.25" x .25" Segmented vessel. Wood species: Cedar, Maple, and Walnut. Origins: USA. Number of Pieces: 601. Hours to Construct: 38. Size: 10" Tall x 10.5" dia. 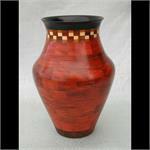 x .187" Segmented vase. Wood species: Cherry, Walnut, Maple, and Bloodwood. Origins: USA & Africa. Number of Pieces: 631. Hours to Construct: 51. Size: 11" Tall x 11.5" dia. x .187" Segmented vessel. Wood species: Cherry, Walnut, Maple, Paela, and Bloodwood. Origins: USA, Latin America, & Brazil. Number of Pieces: 721. Hours to Construct: 32. Size: 10" tall x 10" dia. x .187" Segmented vessel. Wood species: Cherry, Maple, Walnut and Bloodwood. Origins: USA and Brazil. Number of pieces: 91. Hours to construct: 13. Size: 6.5" tall x 3.5" dia. x .187" Segmented vessel. Wood species: Cherry, Wenge, Maple, Walnut, and Bloodwood. Origins: Brazil, Africa, and USA. Number of Pieces: 401. Hours to Construct: 17. size: 9.50" x 7.50" x .25" Segmented vessel. Wood species: Red Heart, Maple, Walnut and Ebony. Origins: Brazil, USA and Africa. Number of pieces: 304. Hours to construct: 21. Size: 9.75" tall x 7.5" dia. x .187" Segmented vessel. Wood species, Purpleheart, Hickory, Maple, Walnut, Bloodwood and Ebony. Origins Brazil, USA and Africa. Number of pieces:432. Hours to construct:32. Size: 9.75" tall x 8.5" dia. x .187" Segmented vessel. Wood species: Hackberry, Maple, Walnut, Yellow Heart, and Lyptus Origins: USA and Brazil. Number of Pieces: 841. 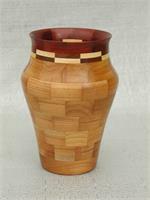 Hours to Construct: 53. size: 9.75" x 10.25" x .25 Segmented vessel. Wood species: Cherry, Paella, Maple, Walnut and Bloodwood. Origins: USA, Lat. America. number of pieces: 291. Hours to construct: 22. Size: 7.5" tall x 5.5" dia. x .187" Segmented vessel. Wood species: Mahogany, Maple, Walnut and Bloodwood. Origins: Honduras, Brazil and USA. Hours to construct: 38. Size: 11.5" Tall x 10.5" dia. 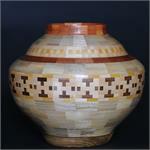 x .187" Segmented vessel. Wood species: Maple, Cherry, and Bloodwood. Origins: USA and Brazil. Number of Pieces: 129. Hours to Construct: 15. size: 6.50" x 5.50" x .25" Segmented vessel. Wood species: Maple, Ebony, Wenge, and Bloodwood. Origins: USA, Africa, and Brazil. Number of Pieces: 181. 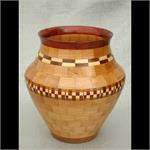 Hours to Construct: 15. size: 7" x 4.50" x .25" Segmented vessel. Wood species: Maple, Walnut, Paela, Bloodwood, and Wenge. Origins: USA, Brazil, and Africa. Number of Pieces: 201. Hours to Construct: 22. size: 5.50" x 5.50" x .25" Segmented vessel. Wood species: Maple, Paela, Walnut, Bloodwood, and Wenge. Origins: USA, Brazil, and Africa. Number of Pieces: 201. Hours to Construct: 22. size: 5" x 5.50" x .25" Segmented vessel. Wood species: Maple, Walnut and Ebony. Origins: USA and Africa. Number of pieces: 609. Hours to construct: 31. Size: 11" tall x 8.25" dia. 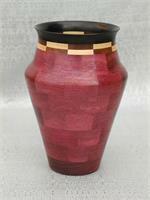 x .187" Segmented vessel. 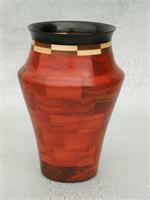 Wood species: Poplar, Wenge, and Bloodwood. Origins: USA, Africa, and Brazil. Number of Pieces: 181. 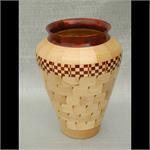 Hours to Construct: 15. size: 7" x 4.50" x .25" Segmented vessel. Wood species: Purple Heart, Maple, Walnut and Ebony. Origins, Brazil, USA and Africa. Number of pieces: 91. Hours to construct: 13. Size: 4" tall x 6" dia. 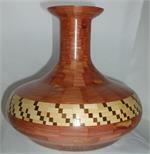 x .187" Segmented vessel. Wood species. Red Heart, Wenge, Cherry, Maple and Walnut. Origins: Brazil, Congo and USA. Number of pieces: 272. Hours to construct: 22.5 Size: 5" Tall x 7.5" dia. x .187" Segmented vessel. Wood species: Red Heart, Maple, Walnut and Ebony. Origins: Brazil, USA and Africa. Number of pieces: 91. Hours to construct: 14. Size: 5" tall x 4" dia. 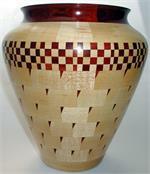 x .187" Segmented vessel. Wood species: Maple Walnut, Paella, Ebony, Bloodwood and Redheart. Origins: USA, Brazil and Africa. Number of pieces: 425. Hours to construct: 16. Size: 8.5" tall x 7.5" dia. 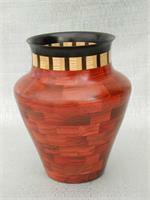 x .187" Segmented vessel. Wood species: Red Heart, Bloodwood, Maple, Walnut, Paela, and Bubinga. Origins: USA, Brazil, and Africa. Number of Pieces: 201. Hours to Construct: 22. size: 6.50" x 5.50" x .25" Segmented vessel. Wood species: Red heart, Ebony, Bloodwood, Maple, Walnut, and Elm. Origins: Brazil, Africa, and USA. Number of Pieces: 601. Hours to Construct: 40. size: 10" x 9.50" x .25" Segmented vessel. Wood species: Red heart, Ebony, Sycamore, and Wenge. Origins: Brazil, Africa, and USA. Number of Pieces: 421. Hours to Construct: 29. size: 10" x 9.50" x .25" Segmented vessel. 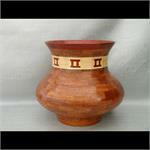 Wood species: Shedua, Bloodwood, Hackberry, and Maple. Origins: Brazil, Africa, and USA. Number of Pieces: 561. Hours to Construct: 33. size: . 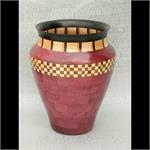 Segmented vessel.